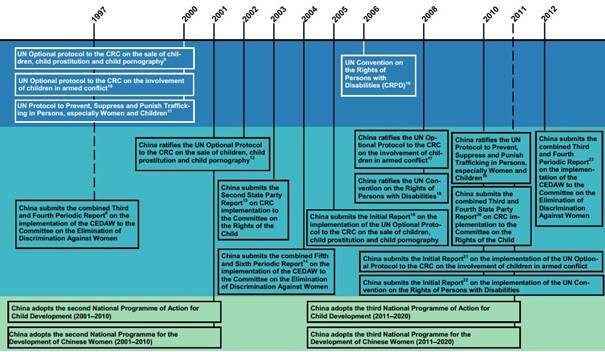 - China's Initial State Party Report was submitted to the Committee on the Rights of the Child in March 1995 through the Ministry of Foreign Affairs. - China's Second State Party Report was submitted in June 2003. - China's latest Combined Third-and-Fourth State Party Report was submitted in July 2010. - The Committee on the Rights of the Child convened to review the latest report in October 2013, and subsequently issued Concluding Observations to China's State Party Reports. In 2006, the National People's Congress approved revisions to the Law on the Protection of Minors, which were uheld in June 2007. Compared with the 1991 version, the revised law explicitly stipulates that minors shall have the right to survival, development, protection and participation in line with the core principles of the Convention on the Rights of the Child. - In 1992, the Government of China adopted a first National Programme of Action for Children (NPA) for the period 1992-2000 also took into account the global goals set at the 1990 World Summit for Children. - In May 2001, the Government of China adopted its second NPA for the period 2001–2010. - In July 2011, the Government of China adopted its third NPA for the period 2011-2020 and serves as both China's national plan to promote children's rights, as well as the country's plan to achieve the Millennium Development Goals (MDGs). The visual (above) illustrates recent efforts made to increase and improve the rights of women and children.